Neither an ankle injury nor her older sister could stop Serena Williams tonight. No. 17 seed Serena Williams, showing no mercy, dominated No. 16 Venus Williams 6-1, 6-2 in 71 minutes in the third round of the U.S. Open in Flushing Meadows, N.Y. It equaled the most lopsided match in the head-to-head series, which Serena leads 18-12 with nine victories in the last 11 matches. Serena won by the same score in the Charleston semifinals on clay in 2013. Serena, a part-time resident of Silicon Valley who will turn 37 on Sept. 26, rolled her right ankle in the second game of the match and had it taped after holding serve for 2-1. The ankle never seemed to hinder during the match, her earliest against Venus, 38, since their first one 20 years ago in the second round of the Australian Open. Serena, whose serve is considered the best in women's history, pounded 10 aces and won 29 of 33 points (88 percent) on her first delivery versus only 19 of 40 (48 percent) for Venus. 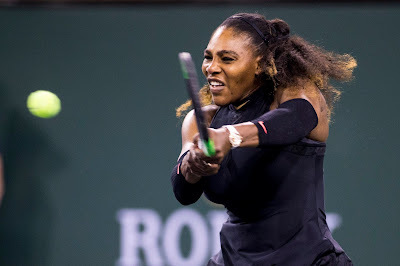 Serena has not lost more than four games in any of her three matches as she tries to win her seventh U.S. Open singles title and tie Margaret Court's record of 24 Grand Slam singles championships. Next for Serena on Sunday is 33-year-old Estonian veteran Kaia Kanepi, a two-time U.S. Open quarterfinalist. Kanepi, who ousted top-ranked Simona Halep in the opening round, defeated Rebecca Peterson of Sweden 6-3, 7-6 (3). Serena has not dropped a set in four career matches against Kanepi, who's ranked 44th after reaching a career-high 15th in 2012. Their last encounter also occurred in the fourth round of the U.S. Open, with Serena winning 6-3, 6-3 in 2014. Meanwhile, No. 3 seed and defending champion Sloane Stephens outclassed two-time U.S. Open runner-up Victoria Azarenka 6-3, 6-4. Azarenka, 29, has plummeted from a career-high No. 1 to No. 79 after having her first child in December 2016 and missing tournaments last year because of a child custody dispute. Stephens, who grew up in Fresno and still has relatives there, is scheduled to play No. 15 seed Elise Mertens, a 22-year-old Belgian who beat No. 23 seed Barbora Strycova of the Czech Republic 6-3, 7-6 (4), on Sunday. Mertens defeated Stephens 7-6 (8), 6-2 two weeks ago in the third round in Cincinnati in their first only previous matchup. No. 8 seed Karolina Pliskova of the Czech Republic got past Sofia Kenin, 19, of Pembroke Pines, Fla., 6-4, 7-6 (2). Pliskova reached the final of the 2016 U.S. Open and 2015 Bank of the West Classic at Stanford, losing to Angelique Kerber each time. Kenin has won a Northern California Challenger for the past three years, including last month's $60,000 Berkeley Tennis Club Challenge. Last year's U.S. Open men's finalists, champion Rafael Nadal and Kevin Anderson, survived stern tests from rising stars. The top-seeded Nadal, who seeks his fourth title in Flushing Meadows, held off 27th-seeded Karen Khachanov, 22, of Russia, 5-7, 7-5, 7-6 (7), 7-6 (3) in four hours, 23 minutes. Anderson, seeded fifth, outlasted 28th-seeded Denis Shapovalov, 19, of Canada 4-6, 6-3, 6-4, 4-6, 6-4 in three hours, 43 minutes. No. 25 Milos Raonic of Canada eliminated Stan Wawrinka, the 2016 U.S. Open champion, 7-6 (6), 6-4, 6-3. Wawrinka had two operations on his left knee last August, returned too soon and sat out again from February to May. In the second round of women's doubles, No. 2 seeds Timea Babos of Hungary and Kristina Mladenovic of France crushed U.S. wild cards Nicole Gibbs (Stanford, 2011-13) and Sabrina Santamaria, both former NCAA doubles champions, 6-0, 6-2 in 51 minutes. Babos and Mladenovic won the Australian Open this year and reached the 2014 Wimbledon final. Alicja Rosolska of Poland and Nikola Mektic of Croatia nipped Makoto Ninomiya and Ben McLachlan (Cal, 2011-14) of Japan 4-6, 6-2 [10-6] in the first round of mixed doubles. McLachlan was born and raised in New Zealand but plays for his mother's native country.